In this Sept. 5, 2018, photo, President Donald Trump's Supreme Court nominee, Brett Kavanaugh testifies before the Senate Judiciary Committee on Capitol Hill in Washington. 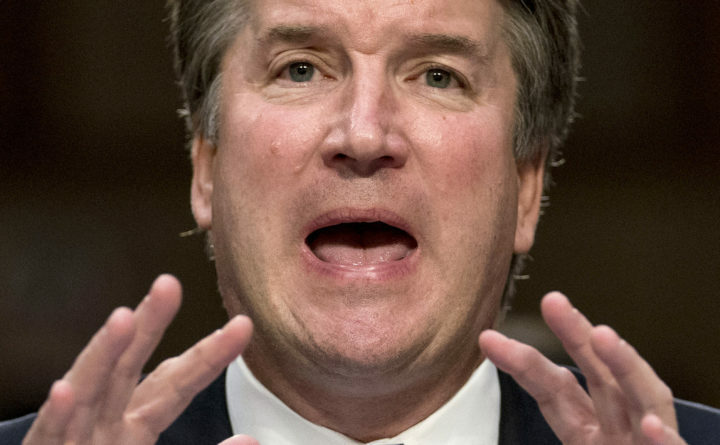 In his testimony to the Senate last week, President Donald Trump’s nominee to replace Justice Anthony Kennedy, Judge Brett Kavanaugh, repeatedly declined opportunities to tell the American people about his views of what the Constitution means, reciting instead his knowledge of past U.S. Supreme Court cases without saying whether he agreed with the constitutional analysis used to reach the results in those cases. Kavanaugh defended his approach by pointing to what other Supreme Court nominees have said, or not said, in past hearings. He even coined a new phrase for this: “nominee precedent.” Kavanaugh, however, took his silence on the Constitution’s meaning to new extremes. When added on top of Trump’s promise to appoint anti-abortion justices to the Supreme Court, Kavanaugh’s refusal should deeply trouble U.S. Sen. Susan Collins — a self-described supporter of abortion rights — as she considers her vote on Kavanaugh. Kavanaugh’s testimony is perhaps best illustrated by his refusal to endorse the Supreme Court’s 1965 decision in Griswold v. Connecticut, which struck down a ban on the use of contraceptives by married couples and set the stage for the landmark 1973 ruling in Roe v. Wade. In his confirmation hearing, Justice Clarence Thomas likewise expressed his agreement with Griswold. He explained that “my bottom line was that I felt that there was a right to privacy in the Constitution, and that the marital right to privacy, of course, is at the core of that.” Justice Samuel Alito offered similar testimony when his nomination was considered. But Kavanaugh refused to offer similar assurances that he agrees with Griswold and that he believes the Constitution protects the basic right of individuals to plan whether and when to have a family. After being pressed repeatedly by U.S. Sen. Kamala Harris, Kavanaugh would only say that Justice Byron White’s concurring opinion in Griswold was a “persuasive application” of Supreme Court precedent. This was an incredibly grudging acceptance of Griswold’s affirmation of liberty, dignity and autonomy. And it should speak volumes to Collins that Kavanaugh championed the approach taken by Justice White’s separate opinion rather than the more renowned concurring opinions written by Justices Arthur Goldberg and John Marshall Harlan II. Why? This was a high-pitched “dog whistle” aimed at the president’s base. Over the course of his career, White repeatedly took an extremely cramped view of the Constitution’s protection of substantive fundamental rights — the right to choose abortion chief among them. Frankly, during his confirmation hearing, Kavanaugh did his best to conceal his views. But by refusing to endorse Griswold — a precedent repeatedly praised by past Republican nominees — and aligning himself with Justice White, Kavanaugh only underscored profound concerns that he will not protect the constitutional guarantees of personal liberty and equal citizenship that underpin the right to choose abortion and plan a family, both fundamental values on which millions in America rely. Kennedy, who retired in June, built his legacy on ensuring that the promise of liberty was enjoyed by everyone in America. Last week’s hearings show there is real reason for any senator concerned with protecting these values to worry that Kavanaugh would roll back that legacy. David Gans is director of the Human Rights, Civil Rights, and Citizenship Program at Constitutional Accountability Center, a public interest law firm and think tank dedicated to promoting the progressive promise of the Constitution’s text and history.